Thanks to Sound Recorder Pro you will be able to directly digitize recordings of music cassettes types, streaming Internet audio, vinyl LPs, videos, and meetings directly to your computer's hard disk, creating popular mp3 or wave sound files on the fly. Sound Recorder Pro can record whatever sound is coming through your sound card, from microphone, cassettes, line-in, LPs, to CD, DVD, your home stereo or any MD player. What's more, it can record sound played by other programs (e.g. RealPlayer, Windows Media Player, Quick Time, WinAmp) including live Internet broadcasts. Sound Recorder Pro can record any signal played through your sound card as Mp3, Wma, Vqf, Ogg or Wav files. 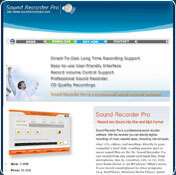 With its powerful sound engine Sound Recorder Pro produces CD quality recordings. Sound Recorder Pro can edit audio files as you desire by cutting, copying, pasting, trimming segments and employing various DSP effects. Sound Recorder Pro can start and stop recording at any time you set. Sound Recorder Pro is able to automatically detect the recording formats your sound card supports and then set the application's parameters for the best possible performance. The default parameters work in most cases, but you can change them easily to best suit your needs. Sound Recorder Pro integrates complete set of record volume control for your convenience. Sound Recorder Pro can record on the fly for as long as your like. Sound Recorder Pro enables you to manage recording files conveniently. Sound Recorder Pro has a Voice Activation System with which you can choose to skip silent passages, or stop the recording after a certain amount of silence. Sound Recorder Pro supports hotkey setting (F8 by default). · Minimum 64 MB of RAM. · Pentium 450 MHz or faster processor. You cannot download any crack or serial number for Sound Recorder Pro on this page. Every software that you are able to download on our site is legal. There is no crack, serial number, hack or activation key for Sound Recorder Pro present here. Our collection also doesn't contain any keygens, because keygen programs are being used in illegal ways which we do not support. All software that you can find here is freely downloadable and legal. Sound Recorder Pro installation package is prepared to be downloaded from our fast download servers. It is checked for possible viruses and is proven to be 100% clean and safe. Various leading antiviruses have been used to test Sound Recorder Pro, if it contains any viruses. No infections have been found and downloading Sound Recorder Pro is completelly problem free because of that reason. Our experts on malware detection tested Sound Recorder Pro with various spyware and malware detection programs, including fyxm.net custom malware and spyware detection, and absolutelly no malware or spyware was found in Sound Recorder Pro. All software that you can find on our servers, including Sound Recorder Pro, is either freeware, shareware or open-source, some of the software packages are demo, trial or patch versions and if possible (public domain licence), we also host official full versions of software. Because we want to be one of the fastest download sites on the web, we host all the software including Sound Recorder Pro on our servers. You cannot find here any torrents or download links that would lead you to dangerous sites. Rate Sound Recorder Pro 2.1!